Deserted islands, crystal-clear lagoons, divine seas and unspoiled beaches—La Maddalena and Olbia feature some of the best places to visit in Sardinia. Suspended between Sardinia and Corsica, the archipelago of La Maddalena is a scattering of seven large islands and 55 islets, featuring some of the best beaches in Sardinia and all of Italy. Although situated just a stone’s throw from the lavish and overdeveloped Costa Smeralda, this place feels like an entirely different universe. La Maddalena is a hidden gem that has not been spoiled yet. I got to explore this paradise for one week—together with a group of friends we rented a yacht and sailed from one place to another, sometimes anchoring in harbors, other times setting down in spectacular bays. 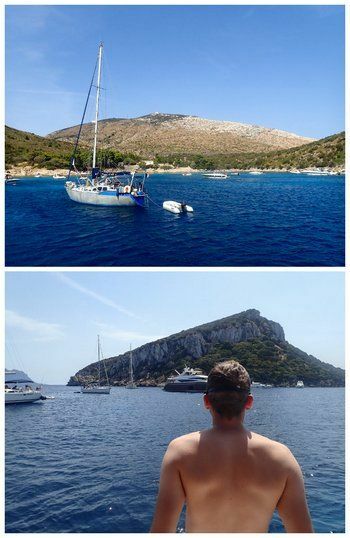 We explored Madalena Archipelago as well as some of the beaches around the city of Olbia, the main access point to the region. Without a doubt, sailing Sardinia was one of my most unique experiences of the past summer. The most convenient way is to travel to Olbia Costa Smeralda Airport, located in the north of Sardinia. 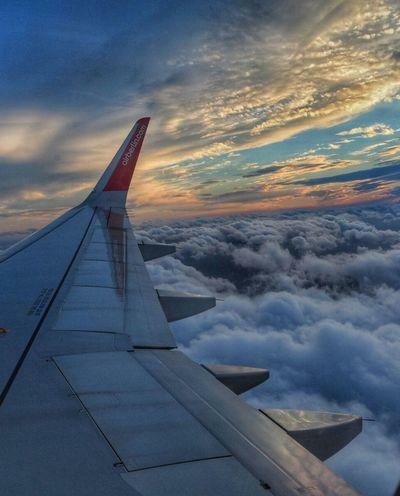 Use Kiwi.com, my favorite flight search tool, to find the cheapest flights. If you are planning to do some sailing in Sardinia, then head directly to the harbor Marina di Olbia, where most sailing trips disembark. It is just 3 kilometers from the airport. I am now sharing with you my favorite places to help you out to plan your Sardinia itinerary. Whether you choose sailing or another method of transport, I am sure you will enjoy the beauty that Sardinia has to offer. Isola di Spargi is small island just across the bay from Maddalena town (the main city of La Maddalena Archipelago). Its beach is said to be the top of La Maddalena beaches and can certainly qualify among the best beaches in Sardinia. the best beaches in La Maddalena. The sea is magical here and the water is incredibly clear, making it ideal for snorkeling. Your chances of spotting large schools of fish here are high. The island is uninhabited and there are no accommodation options, so having your own vessel is pretty much the only way to spend a night here. The experience is pretty special; after 4 pm most day-tripping boats return to the city, leaving the island’s stunning beaches absolutely empty. Needless to say, the place is incredibly peaceful at night. As the island looked very appealing, my friends and I decided to pay a visit to it in the evening. We used our little motorboat and managed not to sink it on the way to shore (a huge success, if you imagine six people huddled together in a tiny boat). We did some hiking around, searching for anything resembling a path through the granite rocks and lush vegetation. We also experienced one of the most colorful sunsets of our whole trip. My Isola di Spargi will always remain fresh in my mind, not only thanks to the island’s sheer beauty but also since it was the first time for me to sleep on a boat somewhere other than a harbor. It was a funny experience since the boat kept moving up and down with the waves and never really settled down. Combined with the small rooms on board, I felt pretty nervous and kept waking up all night long. Idyllic Isola de Buddeli is renowned especially thanks to Pink Beach (Spiaggia Rosa), whose sand gets its signature color from microscopic fragments of coral shells. You can find the beach in the south-eastern part of the island. In order to preserve its delicate beauty, access to the beach is limited; it can be only admired from the nearby beach of Cavaliere and you must be accompanied by a tour guide. Although Budelli features some of the best beaches in La Maddalena, the island is connected with controversy. In 2013, after the bankruptcy of the previous owner, the island was sold to a wealthy New Zealand businessman for 2.94 million euros. Just one month after this transaction, Italy tried to get the island back but did not succeed. Although privately owned, the island is protected by the National Park Board. Isola Budelli turned out to be a much quieter and calmer place to anchor than Spargi Island. Or could it be that I was already getting used to the wavy experience of sleeping at sea? The best part was definitely our morning swim—how great is it to be floating around just a minute after waking up? Caprera Island was the “paradise” of Giuseppe Garigaldi, father of Italian independence, who bought half of the island and made it his home in the 19th century. Nowadays, his house has been turned into a museum and a memorial chapel, making the island a national monument. The island has been declared a nature reservoir and is a home to seabirds, the royal seagull, cormorants, and peregrine falcons. There is a lot of greenery and shade on the island. The island can be reached from the sea as well as by land; Caprera Island is linked to La Maddalena Island by a 600-meter causeway. I had limited time on Isola Caprera but there are definitely things to see there. There are three main beaches to choose from. We visited Due Mari beach as a swimming stop, but if you have more time, you can try the other two as well, Cala Coticcio and Cala Briantina. 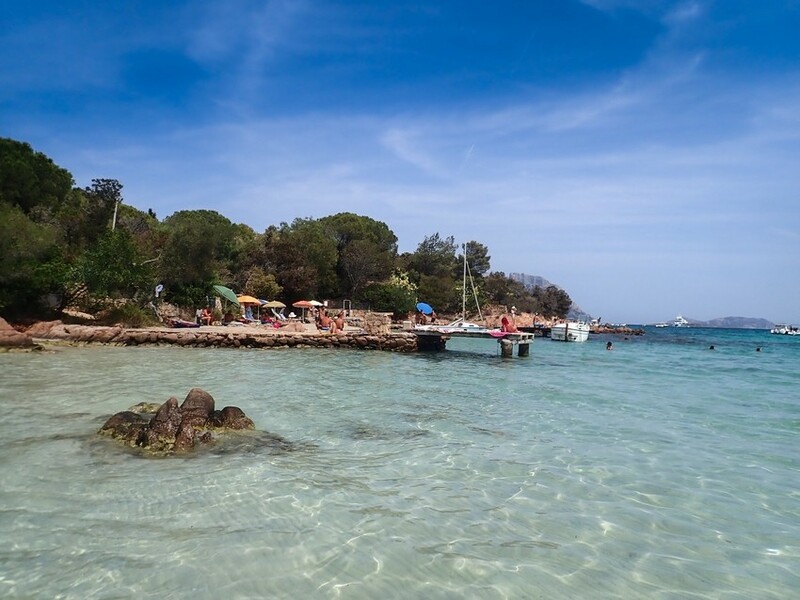 Moving on to our best stops outside of La Maddalena Archipelago and closer to Olbia, the starting and ending point of our trip, charming Cala Moresca beach, located near Golfo Aranci, is one of the best places to visit in Sardinia. There you’ll encounter a golden sand beach with a backdrop of pine trees and also a lighthouse sitting at 340 meters above the sea. Somehow the place as a whole struck me as having a Caribbean vibe. 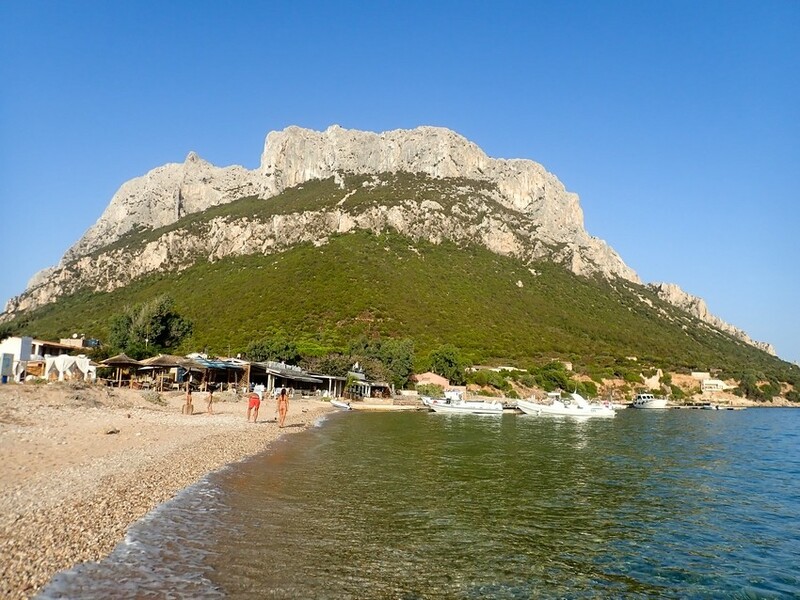 The panorama from the beach is very interesting thanks to nearby Figarolo island, a 139-meter-high limestone plateau with a distinctive pyramid shape. Named due to the presence of fig trees, the island is a natural reserve and home to various species of bird, such as gulls, the Manx shearwater, buzzards, and ravens. Also the underwater life offshore is quite vivid, so keep your eyes open for sea stars and sponges. There are few other beaches apart from Cala Moreca nearby. If you have time, you could easily spend a few days exploring the lovely surrounds. Golfo Aranci is to be found on most Sardinia itineraries. There is no way to mistake this island. You will recognize it pretty much at first sight; it rises wildly from the sea like a steep mountain. The limestone massif is five km long and one km wide, and I would swear there is something mysterious about it. There are no roads or hotels; all you can find there is cliffs, a cemetery, and a few summer-only restaurants. The island is inhabited by only a handful of families; most of the population of the island was displaced in 1962 when NATO built a radiogoniometric station in the eastern part of the island. There is also a transmitter that can send messages to submarines. If you are interested in the history of the island, BBC has a great piece on this topic. The main beach on the island is called Spalmatore di Terra and it’s easy to find. It is popular with sunseekers coming from Olbia for a day trip. However, after 4 or 5 pm all these boats are gone. Just across the bay from Tavolara Island, the emerald waters splash upon another great beach called Porto Istana. It is probably the most accessible beach on this entire the list—if you only make it to one La Maddalena beach, it could very well be this one. Porto Istana consists of a fine, sandy white beach that slopes gently toward the sea. The beach is rather large and popular among locals, so the best idea is to go left when arriving to the beach from the main road. You’ll have access to services including a kiosk, public showers and toilets, as well as various watersport equipment rentals. The exact location is Murta Maria village, just south of Olbia. Maybe there are even better beaches in the north of Olbia, but let me tell you why this makes it among the best beaches in Sardinia: it is located just 6 kilometers from the airport. So this lovely place can be enjoyed right up to a mere few hours before your departure—I spent there my last day in Sardinia there and I loved it! WHAT IS YOUR FAVORITE BEACH IN LA MADDALENA? Some years ago I spent a summer working in the south of Sardinia so I got the chance to visit Cagliari and surrounding areas. I was quite glad to revisit the island and explore the north. Still, I think there is much more to experience. So tell me, which places or beaches in Sardinia did you love the most? All pictures in this article were taken using the waterproof camera Olympus TOUGH TG-5. I was pretty lucky to have it on my trip! I never realised that there were so many different islands around Sardinia. Must have been a wonderful trip. That first shot from belly button down is making me giggle (not in a bad way, just love the perspective!) 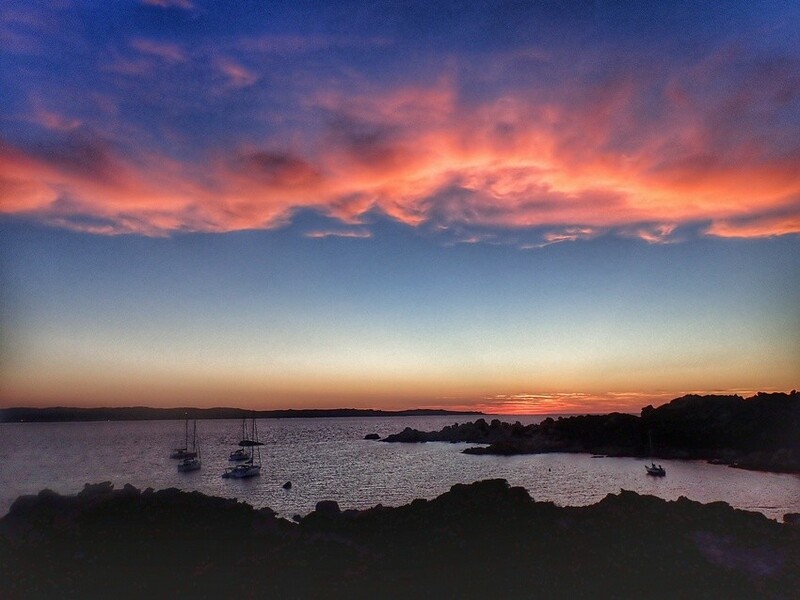 I feel embarassed to admit I had never heard of La Maddalena archipelago until reading your post. 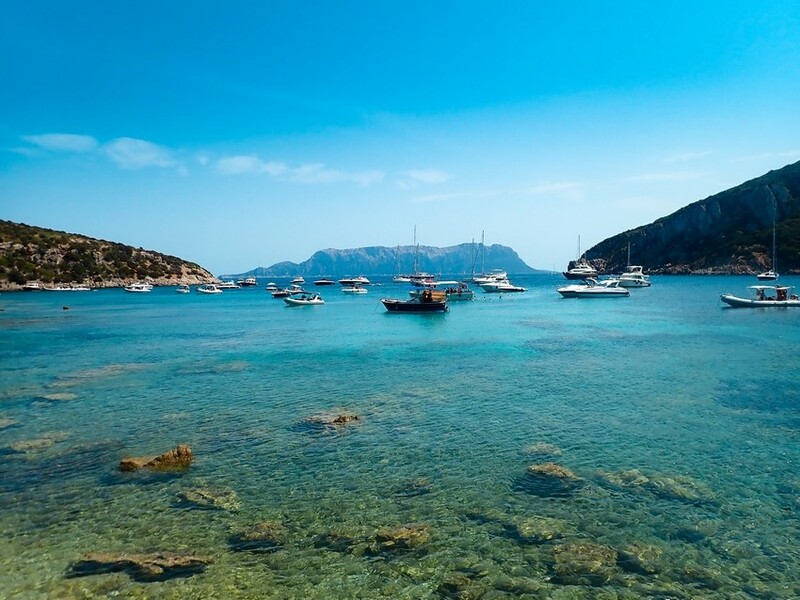 The islands look glorious, I’m especially loving the photographs of Isola de Buddeli and Cala Morecsca but having the opportunity to visit all and compare them as you relax sounds wonderful! Had never really heard of La Maddalena. Corsica is of course a popular destination. the waters and beaches do seem amazing. thanks for letting us know about this hidden gem! I want to visit eccentric beaches. The Pink Beach is a site I’d love to see! Look like you had a great time! 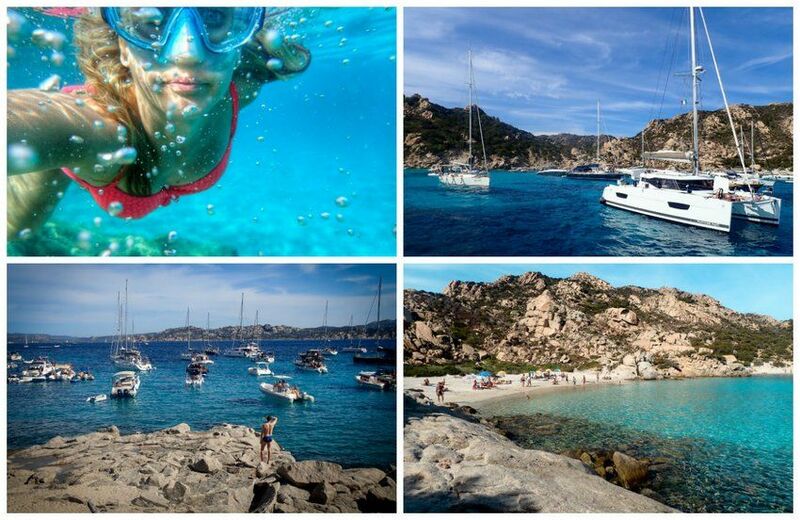 Wow, you really did it right by exploring La Maddalena and Olbia on a yacht! Your photos say it all, must have been such an amazing trip with all those turquoise waters all around you. Oh, I didn’t know Sardinia has its own pink beach in Isola Di Budelli, would love to see it for myself one day! I’ve never been to Sardinia. It looks very beautiful, though. May I ask how much is it to rent a boat? Pretty adventurous but seems like the island hopping is worth it! Just everything a beach destination needs to have! Crystal clear water, bright colors and sunny weather! The feature image at the top is epic in so many different ways! what a POV.